Yes, the first episode of the new AMC series Halt and Catch Fire did premiere on Sunday, but the show is so impressive that I felt it was necessary to do a write-up on the new show. It’s a very important show for AMC, as the network is losing a lot of what made them as respected and distinguished for all these years. Breaking Bad is finished, Mad Men will wrap up next year, and The Walking Dead can only go on for so long. 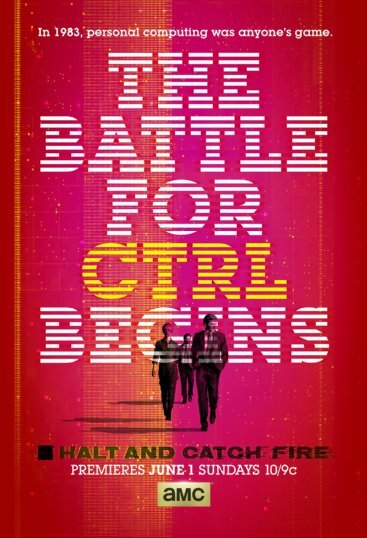 AMC is hoping that Halt and Catch Fire, a program set in Dallas, Texas in the year 1983, when IBM was the ultimate computer to top. It’s an interesting premise for a show, with some really stellar talent in front of the camera, with Lee Pace and Scoot McNairy as the shows male leads, with Mackenzie Davis as the female lead. AMC has been aggressively advertising this show with fantastic promos, unique and beautiful posters (like the one pictured above), and they even released the pilot a few weeks before it aired on television on the internet, of all places. I decided to wait and watch it on the night AMC would like me to. So after I finished up watching the brilliant season finale of Silicon Valley and the penultimate episode of Veep, I watched Halt and Catch Fire, and here are my thoughts. As I said the show takes place in Dallas in the early 80’s. Dallas was a big town with big ambitions in the 80’s, with the most prominent example of such in pop culture being the show, Dallas. Lee Pace plays a man named Joe MacMillan, a mysterious but confident and shady computer man who has a past that I assume will be delved into once the show progresses. He goes to work for a company in Dallas, and meets a deadbeat worker at this company named Gordon Clark, played by Scott McNairy. Together, they decide to take on IBM by replicating on of their very own computers, which at the time was illegal. Mackenzie Davis comes into play as a prodigy computer hacker named Cameron, and together they take on this massive company, and obviously there will be a lot more to the program in the future, but this is just the pilot that I review for you today. The pilot was directed by Juan J. Campanella, whose an Oscar-winning filmmaker from Argentina. He’s mostly made films from his native country to this point, but has directed several episodes of television, including episodes of House, Law and Order, and even 30 Rock. He directs the pilot in a very stylish but subtle way, while using some pretty unique and cool camera techniques throughout the pilot. You do get a feel of the era, from the early personal computers to the atmosphere around the characters (there’s a scene with Gordon and his family walking out of Return of the Jedi). Granted this is just a pilot, but it doesn’t quite have the sense of humor or self-awareness that shows like Breaking Bad or Mad Men had early on, as the tone in the show is pretty serious, and the last time AMC did a fully serious show, last summer’s Low Winter Sun, it ended up being very boring. However, the writing and the acting is so good that it makes up for the lack of laughs, and if the series continues to improve on certain areas, then Halt and Catch Fire could be AMC’s next hit. The show-runners of the program are Christopher Cantwell and Christopher C. Rogers, both of whom are new to the world of television and films. I looked at their IMDB pages, with their previous work being short films. So it’s pretty ballsy of AMC to be able to trust their next big show on show-runners who have never run a television series before. But these two can write some pretty snappy dialogue, and they also do a great job of recapturing Dallas during that era in time. The dialogue is quick and pretty witty at times, and for that the pilot never seemed to be going on too long or dragged along in any way. And that may also have to do with the performances, as Lee Pace is terrific in this role, along with Scoot McNairy, who has ended up as one of my favorite character actors for the past couple of years after his turns in Argo and the rather disappointing Frank this year. Mackenzie Davis shows some real potential here in her role, but she isn’t in the pilot as much as McNairy and Pace, but I do hope that the writers will give her more opportunities to shine in the future. So, from what I’ve seen so far, Halt and Catch Fire has a lot of potential, as well as some room to grow. The show needs to lighten up just a little bit to have more of a broader appeal to the mass audience, but I feel that if AMC does give this show a chance, then this could be a pretty special show. Breaking Bad and Mad Men were slow in their first seasons, so who knows. I’m also giving this program a chance since it’s the summertime, and all of the regular programs I watched beforehand are taking a break, so quality television in the summer is pretty scarce post-Breaking Bad. I’m hoping that this show breaks that trend. June 4, 2014 in Television Reviews.